DR Exclusive! 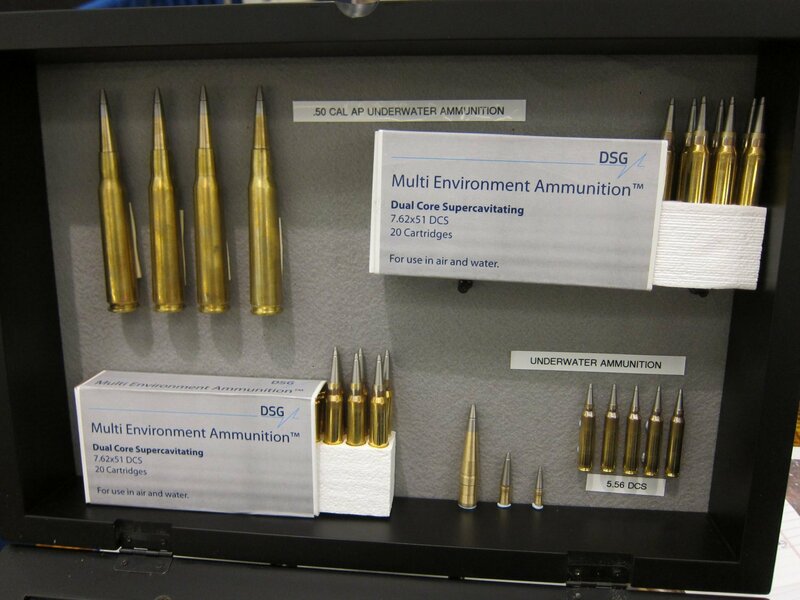 Revolutionary DSG Technology Supercavitating Rifle Ammo for Shooting Underwater (Tactical Underwater Shooting), from Air to Water, and from Water to Air: Amphibious Multi-Environment Ammunition (MEA) for Tactical Waterborne Operations (Photos and Video!) | DefenseReview.com (DR): An online tactical technology and military defense technology magazine with particular focus on the latest and greatest tactical firearms news (tactical gun news), tactical gear news and tactical shooting news. 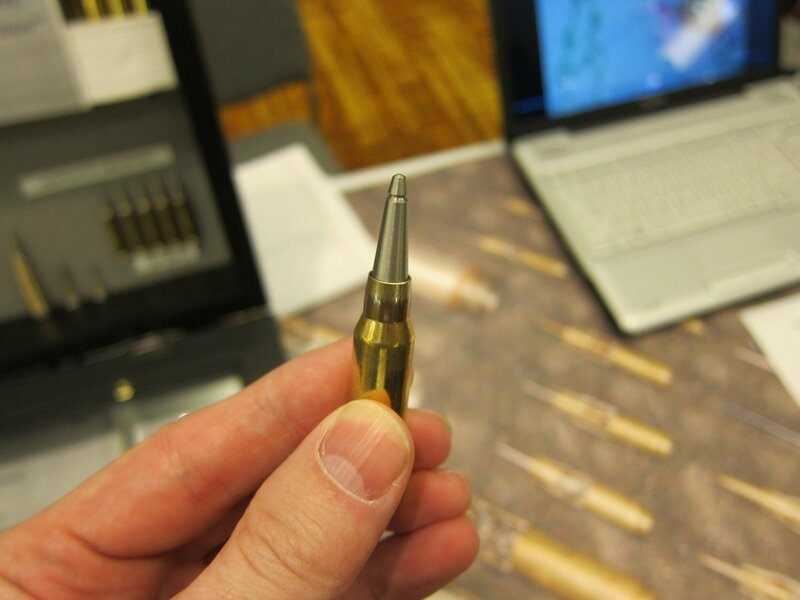 While DefenseReview (DR) was at NDIA Infantry Small Arms Systems Symposium 2011, recently, we came across a booth displaying some of the most interesting and tactically exciting small arms ammunition we’ve ever seen. In fact it’s potentially one of the most important products displayed at the show, in our opinion. The company that makes it is actually a Norwegian company called Defense & Security Group (DSG), and it would appear that they’re poised to create a paradigm shift in military small arms ammunition capability for waterborne operations of just about every type. The DSG Technology ammunition type DR is going to focus on in this article is DSG Multi-Environment Ammunition (MEA) Series Supercavitating Rifle Ammunition (underwater rifle ammo) round, that’s going to be an absolute game-changer for naval and Special Operations waterborne ops of various types, including, but not necessarily limited to, diver protection (defensive) and enemy diver neutralization (offensive) applications, VBSS/MIO (Visit, Board, Search, and Seizure/Maritime Interception Operations) and GOPLATS (Gasoline and Oil Platforms) boarding operations, speedboat interdiction and neutralization, anti-submarine warfare, anti-torpedo operations, and anti-piracy ops. With DSG Technology’s MEA Supercavitating Rifle Ammo, you can fire at an underwater enemy target from above the water, an above-the-water enemy target from below the surface, or at an underwater target while you are also underwater. For example, a U.S. Navy SEAL diver can perform an underwater approach on an enemy vessel and engage targets of opportunity while he’s still submerged several meters underwater. The only caveat is that he’ll have to compensate for optical refraction to hit the target. The same thing goes for engaging underwater targets from above the water. The kicker is that DSG MEA supercavitating ammo also has a unique low-angle capability, allowing an operator/shooter to fire the ammo from above the surface into the water at a very low angle of attack, as low as two degrees in choppy water and 7 degrees into glass-smooth water without ricochet. After entering the water, the bullet will continue its true line of flight. There’s no bullet deflection whatsoever, so the operator only need deal with the aforementioned optical refraction of the water. 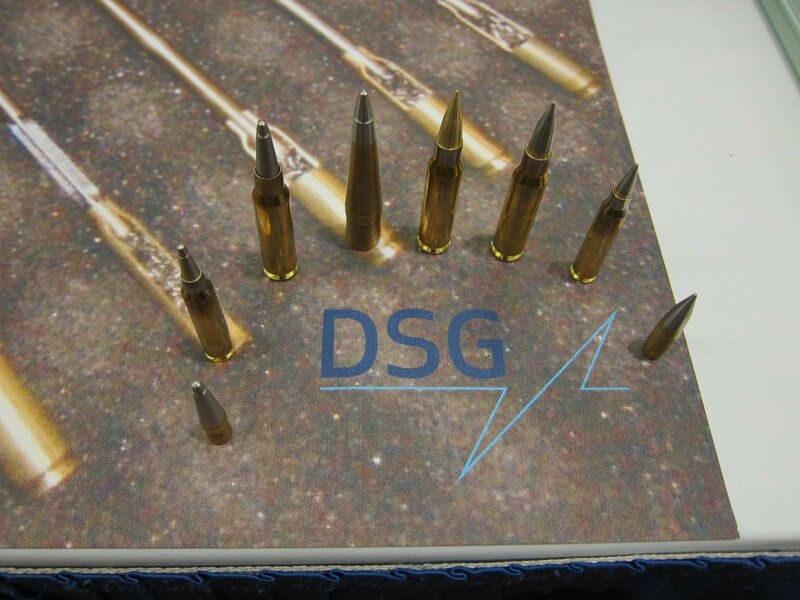 DSG Technology Director of Business Development Richard Morgan took Defense Review through all the DSG Supercavitating Rifle Ammo calibers the company had on display, including 5.56x45mm NATO (5.56mm NATO), 7.62x51mm NATO (7.62mm NATO), and .50 BMG (12.7x99mm NATO). DR didn’t see a DSG supercavitating .338 Lapua Magnum (8.6x70mm or 8.58x70mm) round on display, but it would seem logical that the company has already designed and developed one, since the .338 has become a very popular round for military Special Ops sniper and anti-materiel applications. If they haven’t, they should, and most likely will. But let’s talk about what we know. The 5.56mm NATO DSG MEA dual-core supercavitating (SC) rifle rounds are spin stabilized just like any normal rifle round, so they travel just as far (or farther) and accurately through the air as any standard rifle round. Their uniqueness comes into play once they hit the water. First, when fired into the water from the air, there’s no deflection, i.e., no change in trajectory. The bullet will continue its straight path. The 5.56mm dual-core SC round has an accurate range of 15 meters underwater. 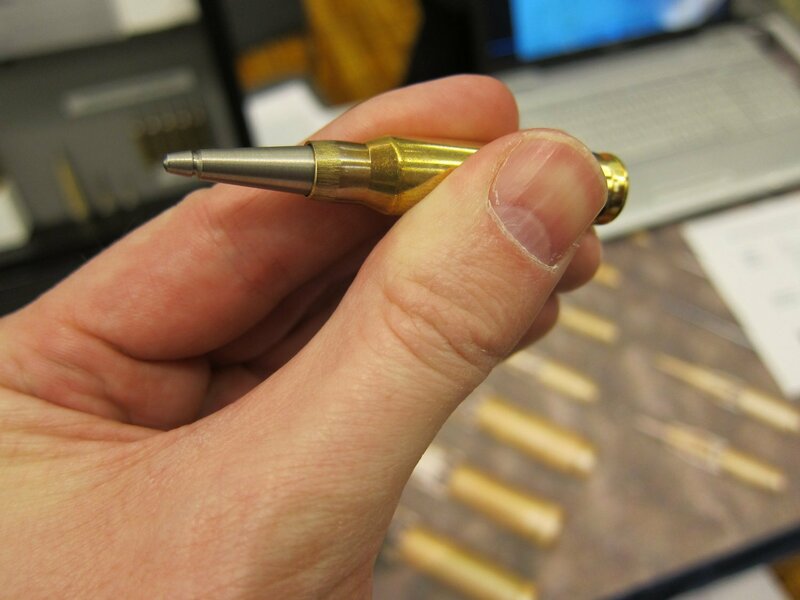 The 7.62mm NATO dual-core SC round has an effective 25 meter range underwater. 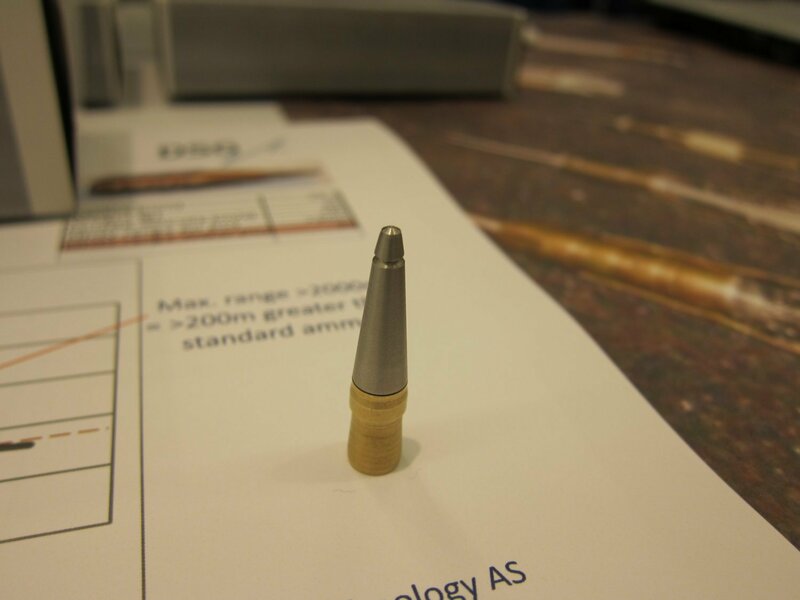 And, the .50 BMG/12.7x88mm NATO dual-core SC round can achieve 60 meters under water. 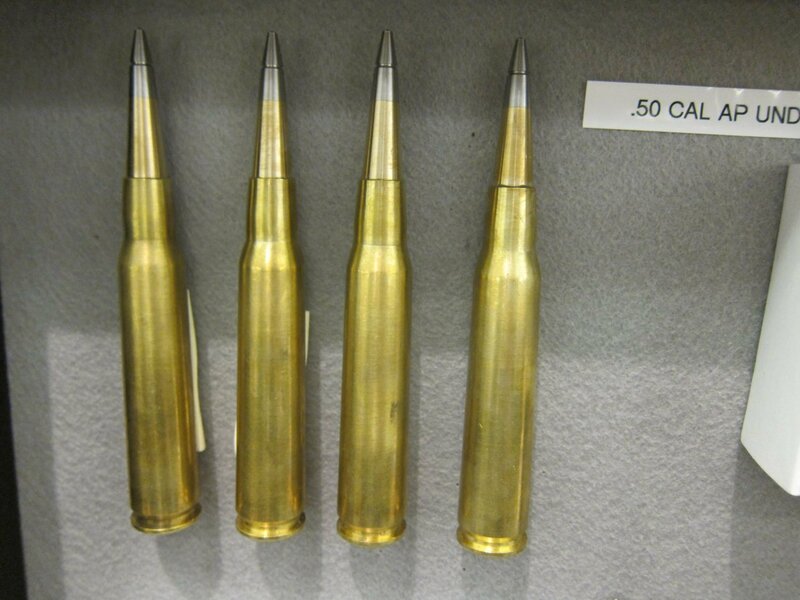 There are three versions of the DSG MEA 7.62mm supercavitating round: General Purpose Supercavitating, Dual Core Supercavitating, and Armor Piercing/Armor Penetrating (AP) Supercavitating. 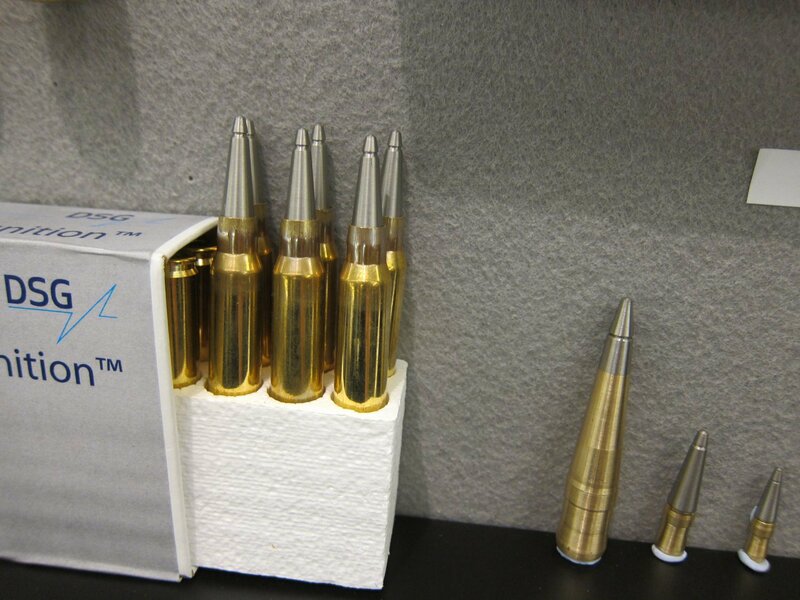 There are two versions of the .50BMG/12.7mm round: Super Sniper Tactical (SST) and Dual Core Supercavitating. “This technology is completely scalable. It works up to very large caliblers, 127mm. We are currently working with the anti-submarine warfare environment where we are doing development work for navies looking at hard-kill torpedo countermeasures. And, we’re using the .50 [.50 BMG caliber], 20mm, and 30mm to kill torpedoes in the water,” says Morgan. Mr. Morgan went on to tell DefenseReview that the DSG MEA supercavitating rifle ammo’s unique underwater kill capabilities allow it to be used for UUV(Unmanned Underwater Vehicle) applications. Provided you have a gun that can work reliably and accurately underwater, you can use the DSG MEA SC ammo to turn UUVs into armed/weaponized UUVs for both offensive and defensive sub-aqua/underwater warfare applications and ops. Morgan told DR that with the .50 BMG supercavitating ammo, an armed UUV can “defeat steel objects” at 60 meters underwater, “or you can point the UUV out of the water, and from 5 meters below the surface, you can hit a target 1,000 meters in the air”, which is a “new application”. Defense Review was really blown away by the DSG MEA Supervavitation Rifle Ammo tech, and we’re looking forward to running some of it when we can, and writing a full review. We’d really like to see how the DSG MEA .50 cal ammo melds with the MICOR Defense Leader 50 .50 BMG sniper/anti-materiel rifle. 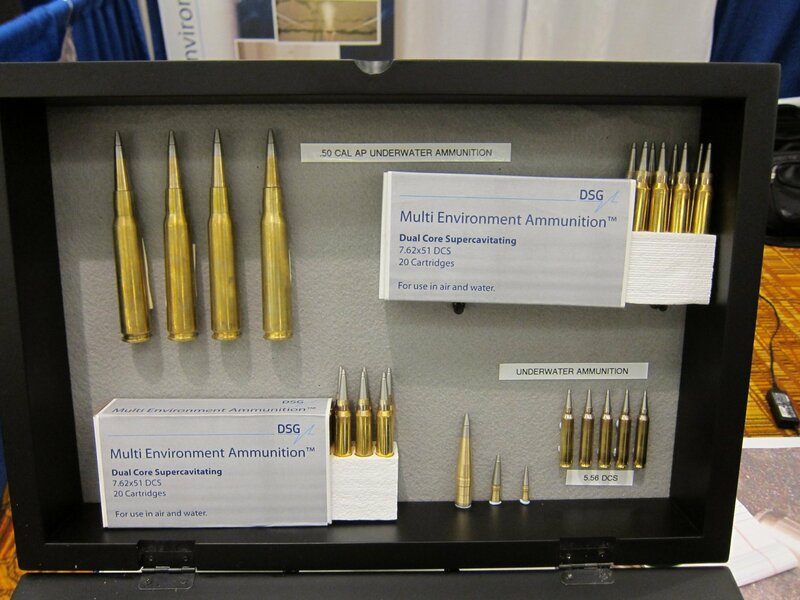 This ammunition would appear to provide tactical professionals with a unique and important capability in waterborne environments. Truly amphibious small arms ammunition. Only in Ameri….I mean, Norway. Also available in 5.56mm, 9mm & 12.7mm with similar attributes. Max. range 950m = 100m greater than standard ammo. Max. range 1040m = 190m greater than standard ammo. Max. range >2000m = >200m greater than standard ammo. performance from standard weapons in air and water. 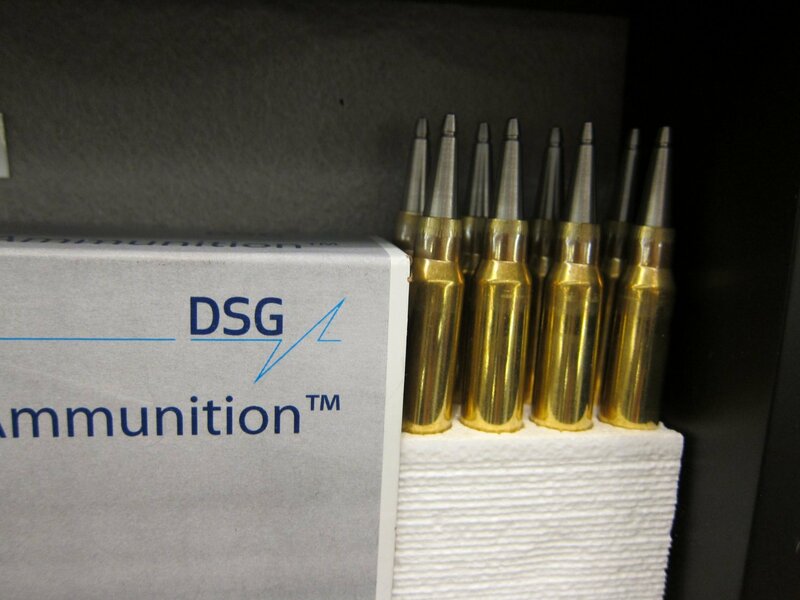 DSG’s Multi Environment Ammunition (MEA), which uses the company’s patented supercavitation technology represents a major R&D investment that gives DSG MEA a singular and world-leading status. This unique ammunition has exceptional capabilities underwater, from air to water and from water to air, even when used with standard, unmodified weapons. These products represent the next generation of ammunition for maritime, littoral, underwater and air/water environments, with new products and ground-breaking applications under continuous development. DSG’s development team includes some of the world’s leading experts and specialists in the field of supercavitating projectile development, responsible for numerous patents and patent applications on the subject. DSG also provides research and development, testing, prototyping, application-verification and consultancy services. DSG MEA technology works with all calibres from 4.5 mm through to 155 mm and is also proven in much larger supercavitating projectiles, including torpedoes, with correspondingly dramatic performance gains. MEA ammunition design enables full-calibre projectiles to be used in standard weapons in air, from air to water, underwater and even from water into air, offering operational solutions for the most demanding situations. Innovative maritime applications are possible using MEA. This product transforms the possibilities for supercavitating projectiles, with greater stability in air thanks to spin-stabilisation and full or near full-calibre rounds, Mine Counter Measures (MCM), and torpedo defence solutions are now real options. MEA offers new possibilities for ASW, Littoral Combat Ships, special operations and MCM and promises a realistic defence against new high-speed undersea threats to shipping.